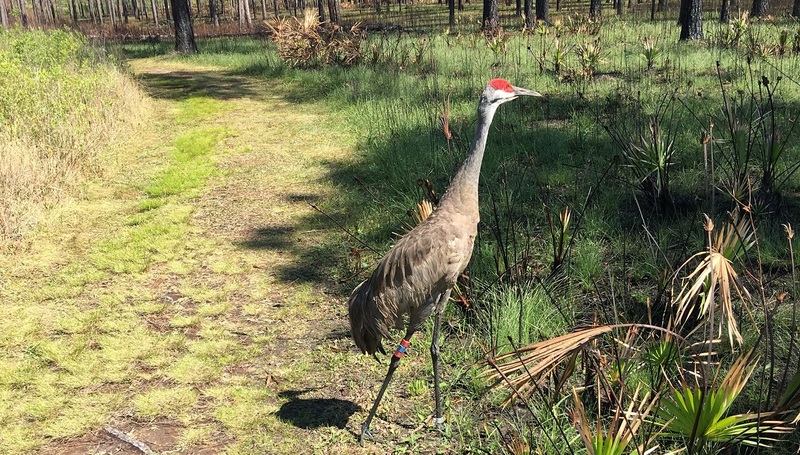 Mississippi Sandhill Crane NWR was established in Jackson County in 1975 for the protection and recovery of its namesake as well as the restoration of the wet pine savanna. The Refuge was one of the first partners to join the Gulf Coast Phenology Trail in 2016 and includes Dee's Trail at the headquarters and the Fountainebleu Trail located at the Fountainebleu Unit. Gulf Coast Phenology Trail core plants include red maple, red bay, yaupon holly, and wax myrtle. Additional species are Chinese tallow, sweet bay magnolia, flowering dogwood, longleaf pine, baccharis, wild pink azalea, and American beauty berry. Observers also watch for Osprey, Bluebird, Cardinal, Blue Jay, Mockingbird, Tufted Titmouse, Mississippi Sandhill Crane, American Robin, and monarch butterfly. Citizen scientists, who include refuge volunteers, retirees and students, use Nature's Notebook for phenology observation, giving them the opportunity to be outdoors.